Sapere Aude! | A travel, food, and general adventuring blog. A travel, food, and general adventuring blog. Come visit the new blog and all past posts at daringtoknow.com. The day we spent attempting to see Gettysburg was an eventful day for our group. Camp Misty Mount, where we were camping, was just a half hour or so away from the famous Civil War battlefield of Gettysburg. Being a kid from the West, I had never visited a Civil War battlefield before (although there are TONS around DC) and thought this would be a good way to spend our day. I was ready to buckle down and learn about a new-to-me period of history! “The Civil War: let’s do this!” I thought, and probably said. Little did we know what fate had in store for us that day. We got to the complex at Gettysburg around 10:30, and that place is HUGE! There’s a museum and visitor’s center that were completed in 2008, both of which are beautifully done. What we didn’t know before arriving was that President Eisenhower’s private farm is nearby, so when you got to tour the battlefield it works out well to pop by the President’s house and then continue on your driving tour of the battlefield. On the fateful day of our visit, guess what was happening at President Eisenhower’s farm? I don’t think you’re going to guess it, so I am going to tell you: a World War II reenactment, complete with a battle (which we missed), actual WWII veterans (of which there must be only a few left in the U.S.- these guys were old! ), and a USO dance in PERIOD COSTUME. As you can imagine, our little group of Europe nerds was sold. We had to go check this thing out! The Eisenhower farm is a worthwhile place to visit in its own right. The farm is a national historic site and is maintained as it was when Ike lived there, including local farmers growing crops that were planted in the surrounding fields back in the day. I didn’t know much about Ike, so the tour of the house was interesting and provided a good overview of his presidency and personal life. While we were wandering the reenactment campsite, I overheard a woman who was meeting one of the Vets there telling him that she was President Eisenhower’s granddaughter! I think it’s pretty cool that she was back at the house and that there’s still a family connection to the property. After a comprehensive tour of the house, we were let loose in the reenactment encampment. It was history nerd heaven! All manner of tents, vehicles and people dressed in period costumes were scattered across a couple acres of farmland. We set to work straight away strolling among the tents, asking people questions and poking through all their equipment and supplies. There were tents with all kinds of themes- a medical tent, an auto mechanic, a sewing/quilting tent, a mess hall, an officer’s tent, and lots of refurbished military vehicles. Most of the tents were focused on U.S. troops, but there was also an international presence- Finnish, British, Italian, Polish, Russian, and German camps were also set up. The German encampment was kind of disturbing- all of the people who were doing reenactments of the Nazis didn’t seem like they had a very good idea of the history behind what they were doing. None of them spoke German except for one woman with a very specific knowledge of Krankenschwestern (Nurses) on the Eastern Front. I have to be honest- they were a little skeezy. The other weird part about it was that it takes a lot to get your hands on old Nazi loot in Germany, so to have amassed such a huge collection of it in the United States seems strange to me. Katelyn, in her infinite good luck and friendliness towards all, secured us a ride on one of the restored military vehicles that a few of the friendlier U.S. camps had. We got to take a quick loop around the fields complete with period music and our driver greeting everyone we passed by addressing their rank (“Move along there Corporal!”). It was excellent in a way that only a ride in a historic vehicle can be. We wrapped up just in time to head back to the visitor’s center to check out the Gettysburg museum (I’d recommend it if you’re in the area- it’s huge, new, and very well-curated!) and do a half-hearted version of the auto tour of the actual battlefield. I am a lackluster Civil War history buff, but a good time was had by all before we returned to camp to cook dinner over a campfire that barely puttered along no matter what we did. Shout-out to Laura for finding this one. This video is weird as heck, but whatever. If my life were a movie, this would be the song for the opening credits. Doesn’t Camp Misty Mount sound like the title of a feel-good children’s movie? I’m thinking the Parent Trap meets a coming-of-age teen romance. There would be s’mores, and life lessons, and at least one incident in which someone falls into a lake fully clothed. In September, feeling adventurous, I rented a cabin with a few friends in Maryland for a weekend of glamour-camping fun. Actually, I take that back. It wasn’t glamour camping. Camping is inherently not glamorous. Camping is all about tying stuff together with a piece of rope you had in your trunk and eating stuff that fell on the ground and cooking as much bacon as possible. All of the bacon. More bacon than is reasonable for any four (fine, two- Katelyn and I did most of the bacon eating while the rest of the group was still asleep) people to consume in one morning. Camp Misty Mount is cool because it was built during the Great Depression as a public works project, which means its a little dated and mostly used for scout groups these days. The cabins themselves were in great shape, but there are just SO MANY BUGS ON THE EAST COAST. It is horrifying. I’m not a squeamish person, but I still get the heebie jeebies around here when I find some of the bigger bugs. They are all such creepy crawlies! One pleasant new experience for me on this trip was ACTUAL COCKROACHES trying to snag bites of the food we set out on our picnic table while we were cooking. Nothing like checking your handful of pretzels for a cockroach under your headlamp before chowing down. Given the bug situation, I think I’d actually rather sleep in a tent that provides full on anti-bug netting than get the “perk” of sleeping on a cot in a cabin. After I got back to DC, I was telling a friend about our experiences and she proceeded to tell me about two times that she stayed in similar digs- one during which a raccoon came out from under the beds while the group was asleep, and another during which a LIVE SNAKE FELL ON HER FACE FROM THE CEILING. I will take a tent for all future camping trips, please and thank you. Other topics of note for this trip: I scored big time before we left and got an awesome vintage two burner propane stove at goodwill for $7. It worked great! We also went on a hike the day we left at the nearby state park that was fine- not hard at all, but at least it was good to get outside. That’s pretty much my measurement of hiking around here now- are you outside? If the answer is yes, it’s a good hike for the East Coast. Our big activity while we were staying at Misty Mount was visiting Gettysburg, which turned into an epic day of history nerdiness. Stay tuned for another post on that. 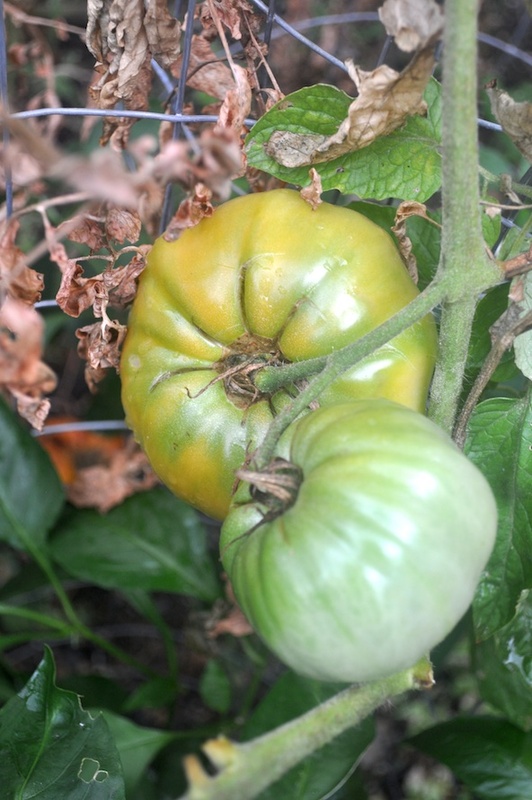 Pardon my major garden update delay- the damn thing started producing so many tomatoes that blogging about it, much like managing the amount of fruit coming at us, seemed like a futile endeavor. I’ve just returned to the DC after a month away, and the garden has held up fairly well even with the beginning of cold weather. The photos above are from the end of August. Tomatoes– The tomatoes I planted all did pretty well, but the winners by a mile were the Cherokee Purples, both those that I bought at the Arboretum plant sale and the ones I grew from seed. Once they started ripening they just couldn’t stop- we had massive tomatoes and massive amounts of them. 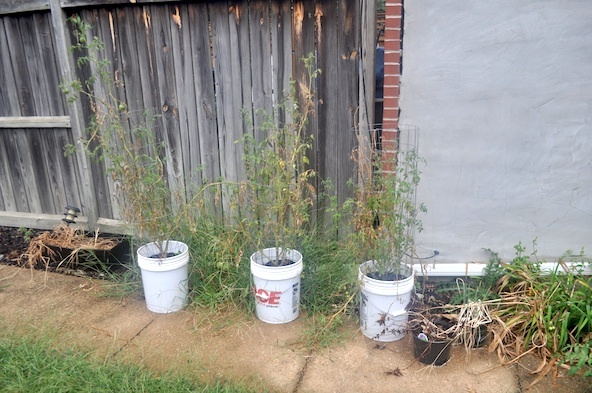 In my over-zealous planting extravaganza last spring, I also put a few tomato plants in 10 gallon buckets. This ended up being a terrible idea once the novelty wore off and the watering schedule set in- things planted in buckets require water, like, all the time. This every-other-day watering got old fast, the plants didn’t grow nearly as fast as those we had in the ground, and the few times we had big storms they got blown over and nearly knocked out of the pots. Next year I am going to skip the buckets and only use our garden bed. 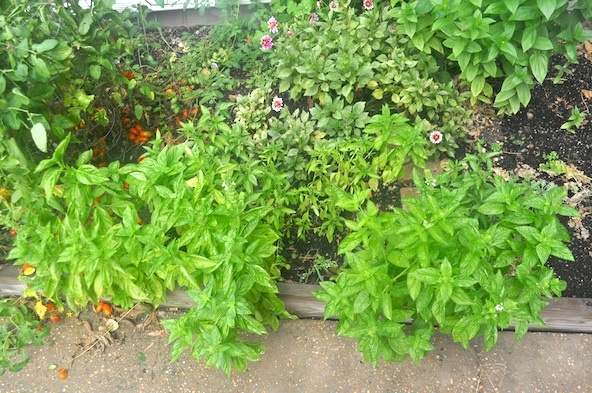 Basil– The basil we grew was amazing and lasted all summer as long as I kept pinching back the flowers. We barely used any of it at our house (sadly- how did I skip making caprese salad even one time this summer?!) but it was a great thing to be able to give to people in great big bunches. I think I will plant some again just for that purpose. 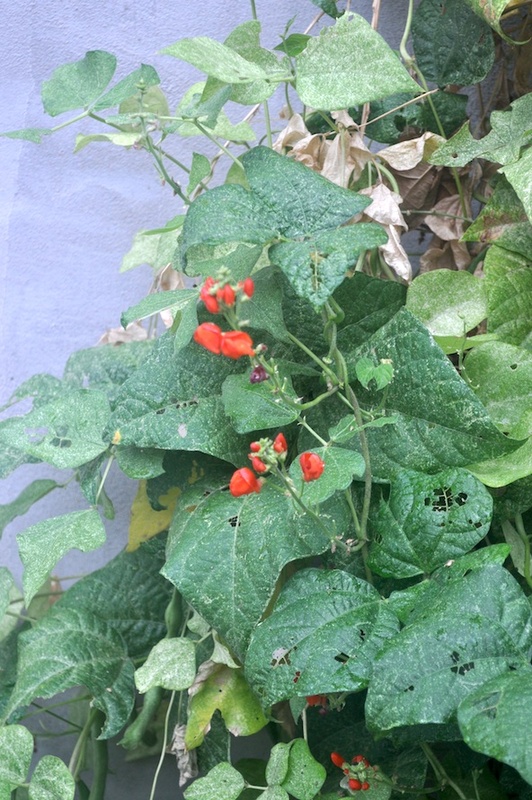 Beans– I planted some scarlet runner bean seeds as an experiment alongside another bean plant I bought as a sprout at a nursery. The scarlet runner beans were nutrient-deprived (as was much else in the garden, more on that in a minute) and could barely compete with the other bean plant for much of the summer, although once the larger green bean plant started to die off the scarlet runners were still holding up pretty well. The beans all looked pretty good, but again, I never ate them. Wah-wahhhh. 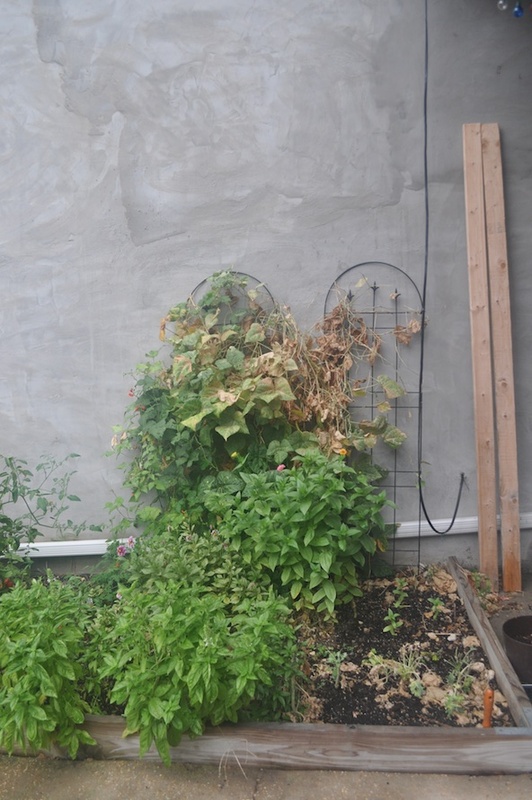 Kale and Lettuce– I pulled up the lettuce about half-way through the summer, but we ate a lot of it when it was doing well and I would certainly plant it again. The kale never really took off as I expected, but I did make kale chips a couple times. I think I need to restrain myself and plant it later in the year next time. Jalapeños and Bell Peppers– these were both awesome to have around. We used a surprising number of jalapeños for pizzas, salsa, pico, and more. The bush of them that I planted grew really well and produced a surprising amount of fruit consistently throughout the summer. My only beef with these things is that whenever I would cut them up my hands would burn for hours afterwards- and they weren’t even that spicy! It was weird. The one bell pepper plant we did produced some tasty peppers but only a total of about 6 over the summer. Next year I’m going to quadruple our bell pepper plants and cut way back on the tomato situation. I also planted a small salsa pepper (I think that’s verbatim what the label said) and one very hot pepper plant, both of which were productive but neither of which saw much action on the dinner table. Dahlias– These were my favorite thing I grew this year. I bought two bushes at the Arboretum plant sale in April, and for whatever reason one of them took off like a bat out of hell, growing to 10x its original size and producing endless small purple flowers. I cut them to take to work, to give to friends, for my room, and for our dining room table. It was great! 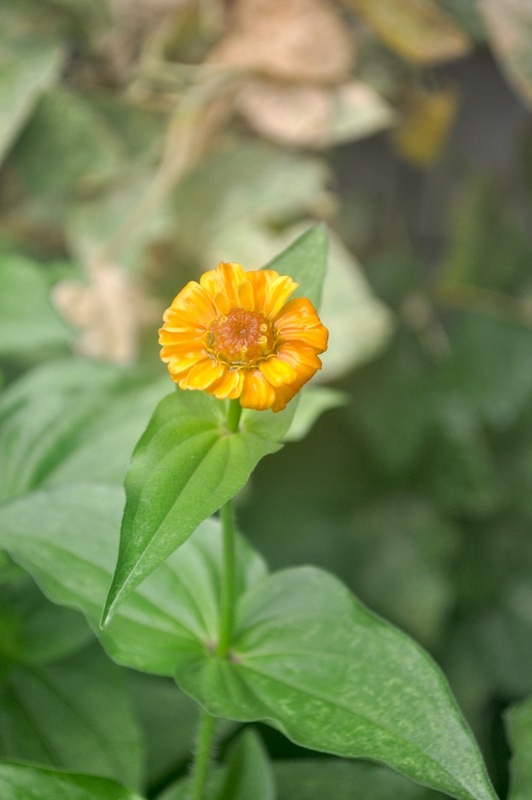 Zinnias– I bought a packet of zinnias on a whim for a dollar fifty, and they ended up being another nice floral addition to the garden. 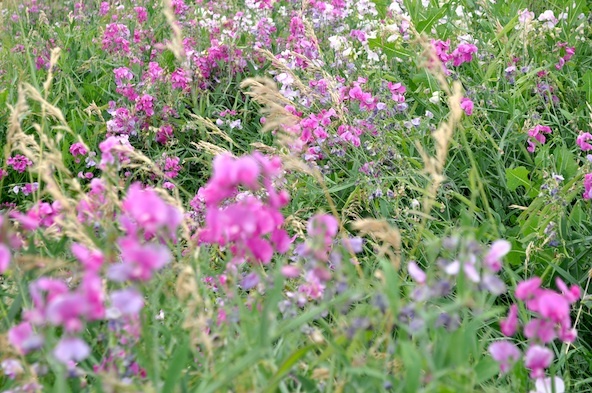 They grow super fast and multiple as you cut flowers from the plants, so by the end of the summer they were producing a few blooms a week in all different colors. 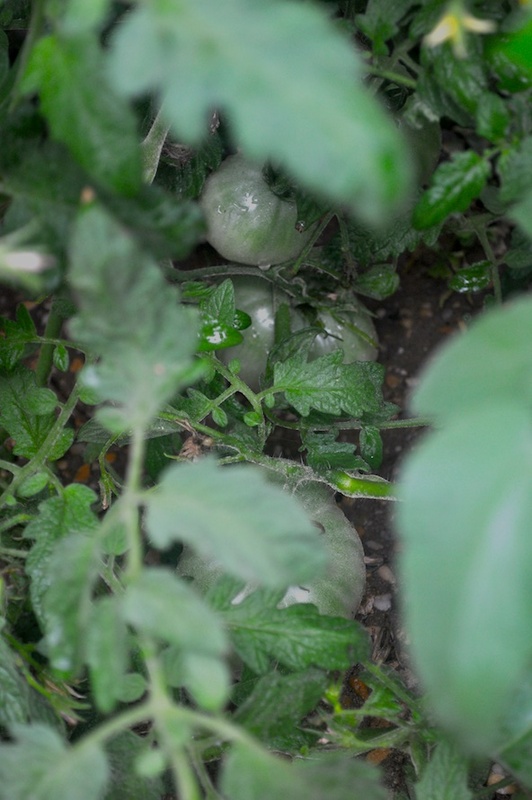 Watermelon, eggplant, and Mexico midget tomatoes– I don’t think I will plant any of these again next year. The watermelon and eggplant completely failed and the Mexico midget tomatoes did a weird thing where they would grow, produce fruit, die, and then start growing again in weird directions. The garden gets plenty of sunlight but they ended up super spindly anyway. Next year I’ve got a few changes in mind, namely planting a lot more flowers, cutting back on the plants I put in containers outside of the garden bed, improving the soil quality by purchasing a bunch of dirt (that’s when you know you’re an adult- when you’re psyched about buying dirt), and planting more bell peppers for our culinary enjoyment. T’was a lovely summer of growing things! On my warp-speed July Colorado trip I tried to get in as much outside time as possible. 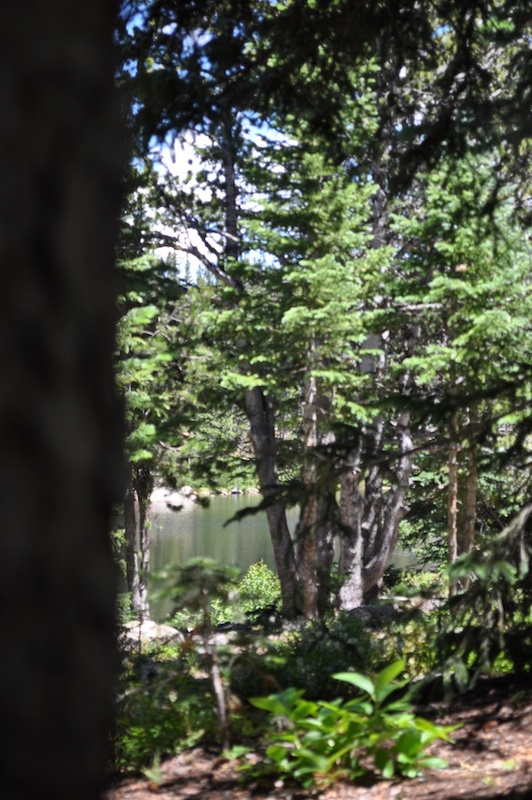 I decided to branch out a bit and try out the hike to Lost Lake, which is really close to the tiny town of Nederland (just up the canyon from Boulder) and a very popular destination out of the front range. 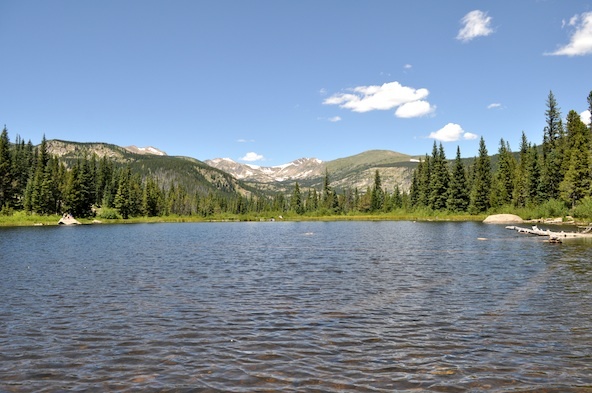 Indeed, the trail was pretty busy when I went up, but the views were amazing and the Indian Peaks Wilderness (one of my favorites) is just stunning. The Fourth of July Trailhead (where this hike, and many other favorites of mine, like Diamond Lake) is always packed, so I took a shuttle from the park’n’ride in Nederland up to the trail. Ned is a funny place- it’s a hippie haven, but still retains that old west feel. There’s a big fancy German restaurant (a must for a good mountain town) and a bunch of shops selling crystals and all manners of goodness for your inner goddess. Definitely entertaining to check out if you get the chance. My shuttle bus driver was a great Nederlander example- he was super friendly, and while we were waiting for others to board the bus he realized he had hit a bee on his windshield, which he promptly scraped off and saved to “identify later”. 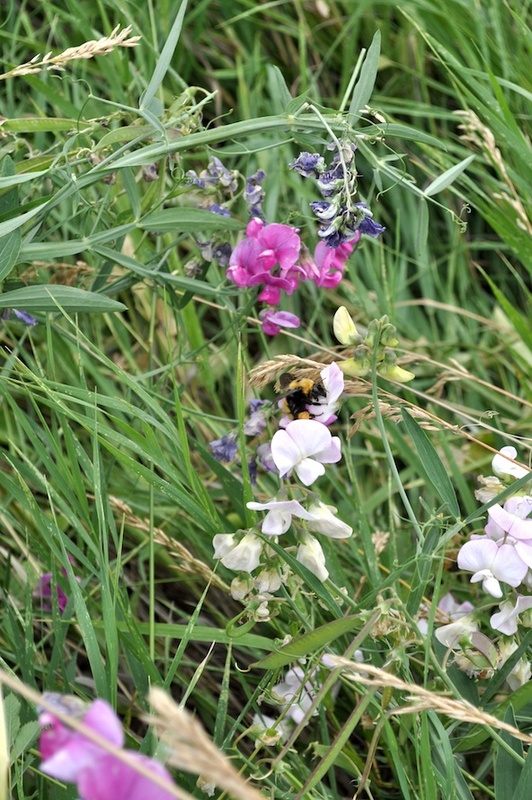 This was all accompanied by joyous whooping and discussion of the different types of wild bees. In true Ned fashion, another grizzled old mountain man boarded and proceeded to ask his fellow bus riders how long we thought salmon would keep unrefridgerated. The bus consensus was about a week- I’m not sure how accurate that is, but this guy looked like he had probably already eaten a lot of weird old stuff out in the wilderness, so I’m sure he was fine. 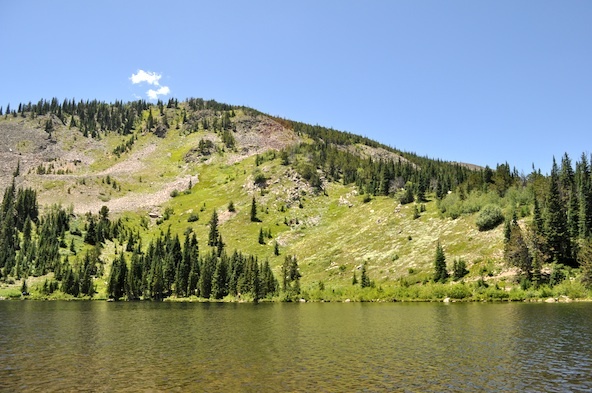 The hike is short- maybe 4 miles roundtrip- so I finished the whole trip from Boulder to the lake and back in about 4 hours. 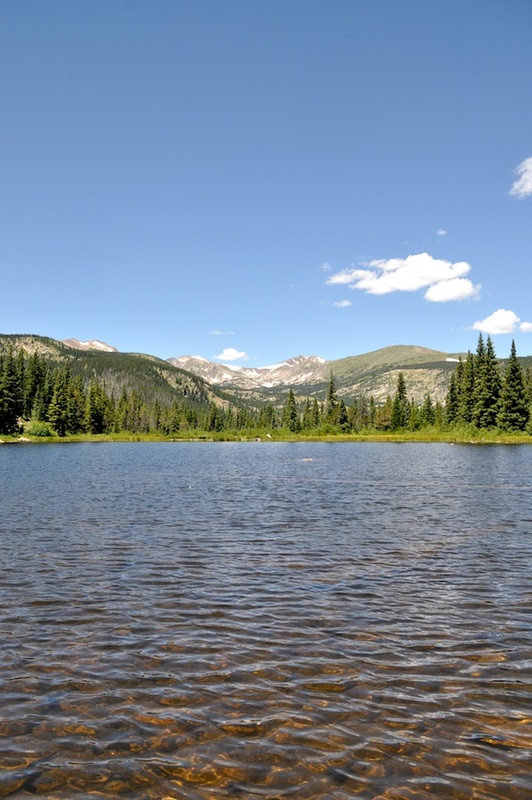 Arriving at the lake, I kept with tradition and peeled off my hiking boots and socks to dip my toes in the water. It’s a real treat to get to spend some time gazing out at the mountains on a sunny day, even more so when you don’t get to see ’em all that often. 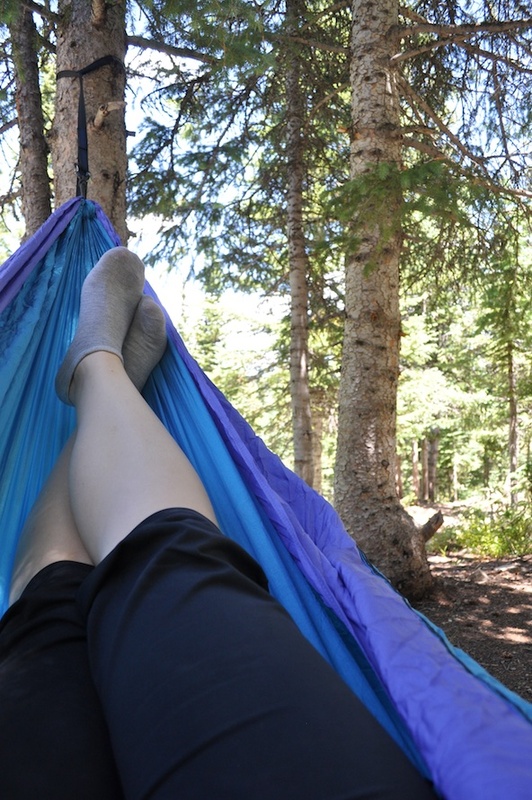 I then set up my hammock at a campsite by the lake for a brief nap, which was glorious. Bringing a hammock hiking is always a good idea. I’m about to bike to work and will hopefully miss the Pope-pacalyptic traffic that’s due to strike the nation’s capitol today. Happy Wednesday! Guys, the soundtrack for Paper Towns is amazzzinng. 10/10, would recommend to a friend on the internet. 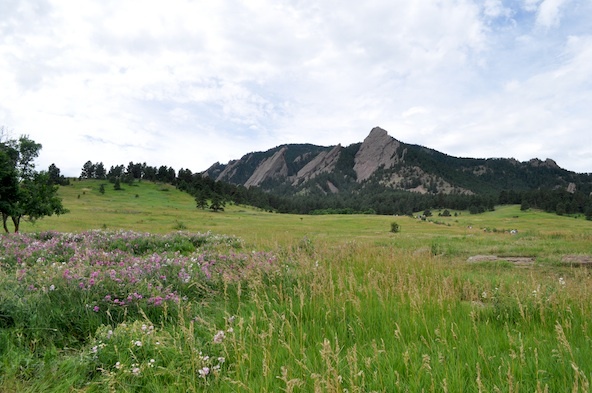 I went to an absolutely lovely wedding this summer in Boulder. I had a blast revisiting wonderful people and a wonderful city set in one of the most beautiful places on earth. Colorado, you may be getting crowded, but damn. You still got it. 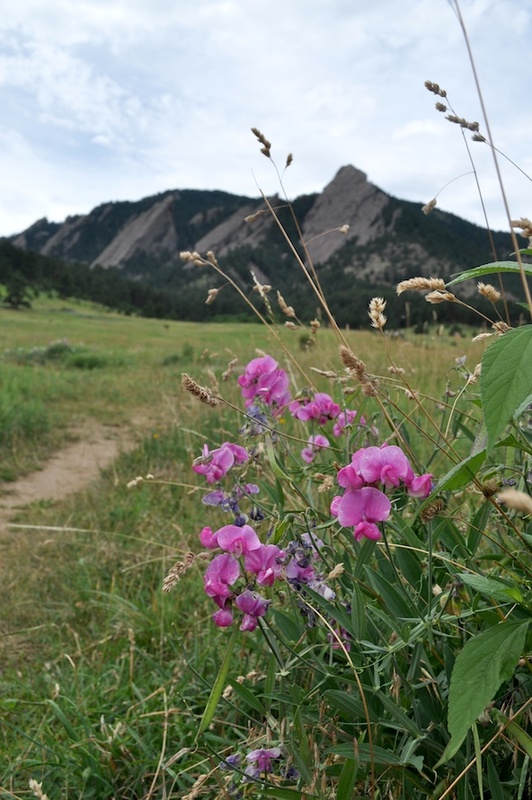 I hiked the 3rd/4th Flatirons during the day before the wedding; the place was packed for a Friday but the sweet peas were blooming and everything was delightfully green. I tromped into the grass to get these photos, following the footsteps of what must have been many a couple taking wedding or engagement photos before me. What a backdrop, eh?